Mutual relationship between a regulated business and their customer begins with a simple step: Know Your Customer (KYC). This process was fraught with paper work, intrusive checks and prohibitive costs to the tune of INR 150 – 175 per KYC. Aadhaar changed this dramatically with the introduction of Aadhaar eKYC in 2016 bringing down the costs to circa INR 15 (90% reduction). All a citizen had to do was provide their Aadhaar (Unique 12 digit number) and biometrics (fingerprint of iris) and the KYC was done electronically. Instantly. However, the Supreme Court of India – taking on as many as 31 petitions on the grounds that it violated people’s privacy – on 26 September 2018, ruled that Section 57 of the Aadhaar Act, which allows wide use of Aadhaar KYC by private companies, is unconstitutional without the backing of new laws. Aadhaar itself survived with exemplary arguments from both proponents and opponents of Aadhaar. Since this ruling, there has been tremendous ambiguity among regulators, service providers, and consumers alike. Whilst there has been attempts by proponents to instill confidence, the regulators themselves have not provided any clarity to the use of Aadhaar KYC one way or the other. But one thing that is crystal is that Aadhaar is not binding in contemporary India and citizens can choose any form of government identity of his or her choice. The general fear is that this will lead to paper identity modalities (alternates to Aadhaar) which will increase operational costs and reduce convenience. As they say, necessity brings new innovations and one such is the Atlas KYC solution that works just as well as the Aadhaar KYC in the Indian context. In order to verify a person’s identity, the following information is needed: A proof of ID, A proof of address and a recent photograph. All of this is provided by Aadhaar KYC (albeit the recentness of the photograph is debatable as mine is about 7 years old at the time of writing this). The same can also be obtained in a variety of documents such as PAN Card, Voter ID, Driver’s license and Passport. However, one of the issues with offline modalities is that while the authenticity of the ID can be established (i.e. not tampered or forged), it doesn’t prove that the ID belongs to the person holding it (e.g. stolen identities). This really is the core of what Atlas KYC purports to solve. It provides a simple ID scanning method, which auto populates the digital form or reads the QR of the Aadhaar in offline mode and takes a selfie with liveness checks (e.g. either a selfie with a blink or a video with a voice prompt). In the background, necessary facial matching and fraud checks are done to ensure that the person holding the ID is the true owner of the ID. Besides, the demographic KYC details captured will be same as what Aadhaar KYC provides now. Digitally. Instantly. While both Aadhaar KYC and Atlas KYC will require a face to face meeting (as per current regulations in India without Aadhaar eKYC using OTP), repeat KYC updation (e.g. change of address) or periodic updation as per RBI regulation (Part V – Article 38 of Master KYC Circular of RBI) for Bank Account holders in India, Atlas KYC can be used by customers at the comfort of their homes without having to visit their Bank branches. And can be completed in under a minute. 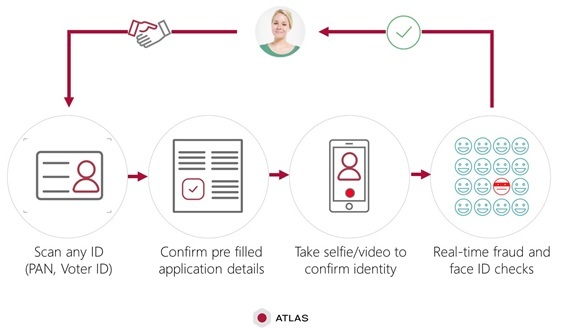 So here’s how Atlas KYC works. The Service provider scans the IDs (using their own App with Atlas integrated into it). Atlas software extracts the ID details through OCR (Optical Character Recognition) and auto populates the KYC form (e.g. Name, Address, DOB, Gender etc.). Note that this form will resemble exactly as the Aadhaar KYC returned from UIDAI. The customer verifies the details and consents to sharing them with the service provider. The service provider captures a KYC selfie with a liveness challenge (e.g. blink or a voice prompt). A quick fraud check is done in the background using the customer image and demographic data. Note that this step is optional and is warranted only for high risk accounts to have protection against identity theft or organised crimes. Once verified, the customer is onboarded. The whole process takes 2-3 minutes. Atlas ID Scanning and Face capture is capable of running locally on mobile devices, therefore there is no need for service providers to invest in backend server infrastructure as was needed for Aadhaar KYC. A backend server is needed only if a comprehensive fraud check is warranted in the background. With a lightweight SDK and APIs, the whole integration can be done in a couple of days by service providers. Imagine now being able to open a Bank Account or obtain a SIM just as easy as using Aadhaar KYC. About FRS Labs: From preventing fraud to verifying identity (KYC), we help organizations onboard and retain good customers. Our patent pending solutions can be quickly integrated into existing web and mobile applications.